The Israeli occupation forces (IOF) on Friday afternoon violently attacked Palestinian and foreign activists during their participation in the weekly anti-wall marches in Bil'in and Ni'lin towns near Ramallah city. Scores of protesters suffered from inhaling tear gas and received treatment from paramedics, according to activists. A number of participants in the Ni'lin march, however, managed to reach the wall and place the Palestinian flag on it despite the intensive presence of Israeli troops. In the Bil'in march, the participants chanted slogans advocating national unity and denouncing Israel's confiscation of Palestinian lands. 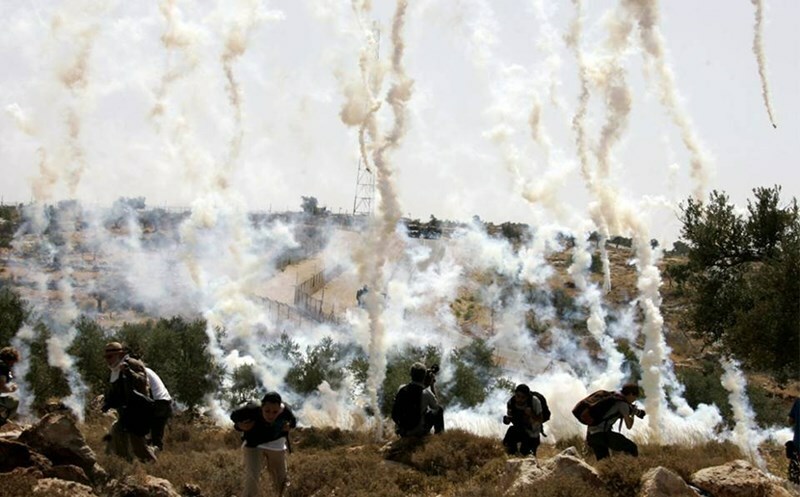 The popular committee against the wall in Bil'in said that Israeli soldiers chased the protesters and randomly fired tear gas grenades at them and at nearby homes, which caused many children, women and elderly people to suffer from suffocation. 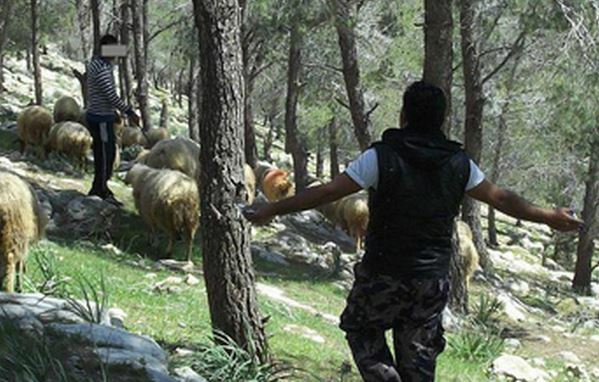 Palestinian medical sources have reported that a shepherd was injured after a group of Israeli extremists attacked him, east of Yatta town, near the southern West Bank city of Hebron. The sources said Jibreel Mohammad No’man, 55 years of age, suffered various cuts and bruises in Eqwewiss area, east of Yatta. Rateb Jabour, coordinator of the Popular Committee Against the Wall and Settlements in Hebron, said that attackers came from a nearby illegal Israeli colony. Jabour called on international legal and human rights groups to intervene and stop the Israeli escalation and violations against the Palestinians, and to provide them the needed protection. The attack is part of ongoing assaults carried out by Israeli fanatics and extremists against the Palestinians, their land, property and their holy sites in different parts of the occupied West Bank, and occupied East Jerusalem. Israeli soldiers invaded, on Wednesday at dawn, the village of Wadi Fukin, west of Bethlehem in the West Bank, stormed several homes, and photographed families. Head of the Wadi Fukin Village Council Ahmad Sukkar said a large military force invaded the village, before the soldiers stormed dozens of homes and counted the number of rooms each home has, in addition to taking pictures of the families and their properties. The homes belong to many residents; some of them have been identified as Yasser Issa al-Hroub, Mohammad Yousef al-Hroub, Jihad al-Hroub, Mahmoud Jum’a ‘Assaf, and Yousef ‘Ezzat Manasra. Sukkar said that, approximately two weeks ago, the army started similar invasions that included taking pictures of homes, residents and collecting personal information from the families. He warmed that such activities could have serious implications on the families and their very existence in their own homes and lands. 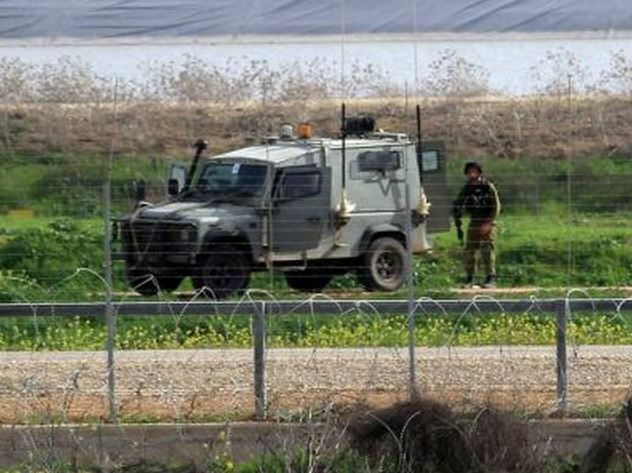 Israeli soldiers, stationed on military towers across the border fence, opened fire on Tuesday evening, on Palestinian farmers and their lands, east of the al-Maghazi, in central Gaza. Eyewitnesses said the soldiers fired rounds of live ammunition on the farmers, forcing them to leave; the attack caused no injuries. The attack is part of repeated violations against the Palestinians and their lands, especially in areas close to the border, in addition to ongoing violations against the fishers in Palestinian territorial waters, and even while on shore. On Tuesday morning, soldiers opened fire towards Palestinian shepherds near the cemetery in Jabalia, in the northern Gaza Strip, while Israeli gunboats targeted fishing boats in Khan Younis, on Monday at night, in Gaza's southern region. 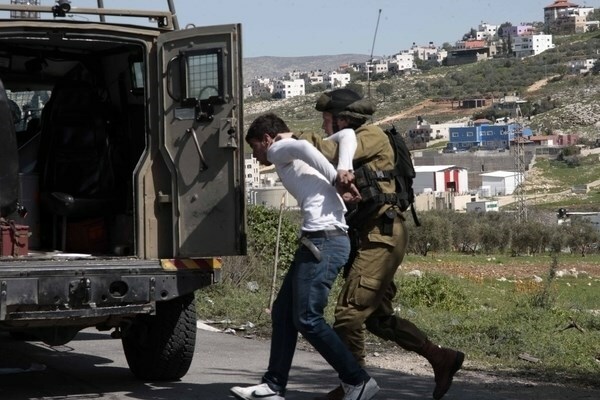 The Israeli occupation forces (IOF) afternoon Tuesday and at dawn Wednesday rounded up two Palestinian civilians following raids in the West Bank cities of Nablus and al-Khalil. A PIC journalist quoted sources based in Nablus as reporting that the IOF troops stormed Ourata town, to the southeast of the city, at 1 a.m. and scoured a number of Palestinian family homes in the area. The IOF soldiers reportedly broke into the family home of the Palestinian civilian Khaled al-Qadhi and ransacked it, moments before they locked up the native inhabitants, handcuffed and blindfolded, in a single room. The attack culminated in the abduction of Khaled’s son, 35-year-old ex-prisoner Moslem al-Qadhi, working as an educational consultant. Earlier, afternoon Tuesday, the IOF patrols nabbed the Palestinian ex-prisoner Ahmad Abu Hashem, 48, from al-Khalil’s northern town of Beit Ummar. Locals said a group of IOF soldiers raided Beit Ummar and searched a vehicle carrying Abu Hashem, shortly before they abducted the man and transferred him to an unknown location. Both Abu Hashem, an active anti-settlement campaigner, and his son have reportedly been arrested for several times before by the IOF. Meanwhile, the IOF troops Tuesday stormed Ein Shebleh town, located in the Central Jordan Valley, near Nablus city. A round of combing operations and abrupt home break-ins had randomly been carried out by the invading IOF soldiers, stirring up a round of altercations and clashes with the Palestinian natives. In a related development a horde of Israeli fanatic settlers heavily beat a Palestinian civilian youth near Jaloud village, in Nablus. Eye-witnesses said the settlers dealt heavy head blows to the casualty, identified as Dhafer Is, using an iron bar. The casualty was transferred to the Rafidia public hospital in Nablus to receive urgent treatment for the wounds sustained in the assault. Israeli forces opened fire, on Tuesday morning, towards Palestinian shepherds near the cemetery in Jabaliya, in the northern Gaza Strip, while Israeli gunboats targeted fishing boats in Khan Younis, last night, in Gaza's southern region. 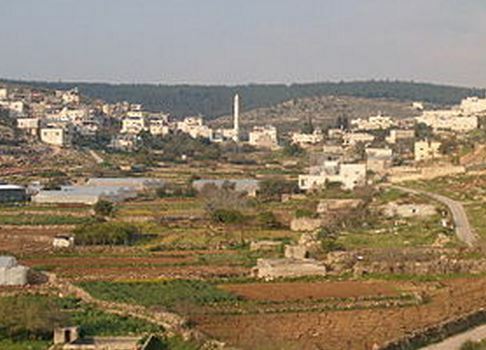 According to Al Ray Palestinian Media Agency, security forces reported that a number of soldiers exited military jeeps and shot toward shepherds near the eastern cemetery; no injuries were reported. 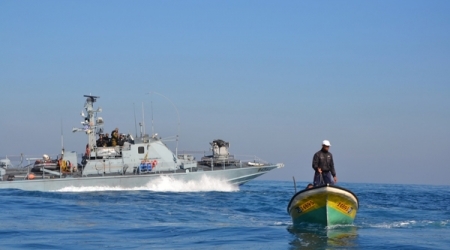 Eyewitnesses additionally stated that Israeli naval gunboats fired heavily towards Palestinian fishing boats off Khan Younis shores, Monday night. No casualties were reported. Israeli forces routinely attack Gaza fishermen and their boats in the context of Israel’s Egyptian-backed siege on the region, which includes restrictions on the fishing zone, depriving members of the community of their right to work, and in addition to putting their lives and well-being at serious risk. The attacks include violations on citizens' right to livelihood, harassment and shootings, arbitrary arrests and detention involving abuse, and confiscation of property such as fishing boats and nets. In 2013, Israeli forces carried out 147 documented attacks against fishermen, according to Al Ray, injuring 10, arresting 22, confiscating 9 boats, and destroying extensive amounts of fishing equipment. A round of violent clashes broke out at dawn Tuesday between the Israeli occupation forces (IOF) and a group of Palestinian civilian youths in Jenin’s eastern town of Qabatiya. Local sources said IOF soldiers in a flock of Israeli military jeeps stormed the town at dawn and cordoned off al-Hisba area, moments before they attacked a group of Palestinian protesters with randomly-shot volleys of tear gas and gunfire. 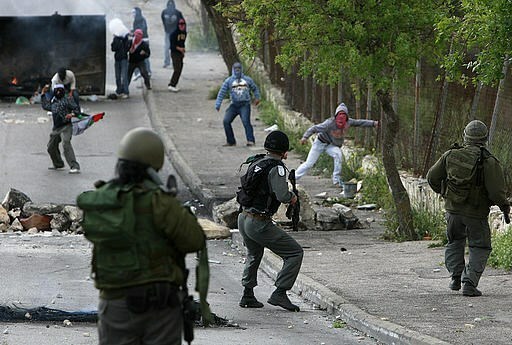 A number of Palestinian youths choked on tear gas in the process, the same sources added. The attack culminated in raids on the family homes of the Palestinian citizens Barjas Al- Hamamda and Mahmoud Zakarna al-Shamsi. The IOF troops reportedly assaulted the family members and turned the houses upside down. 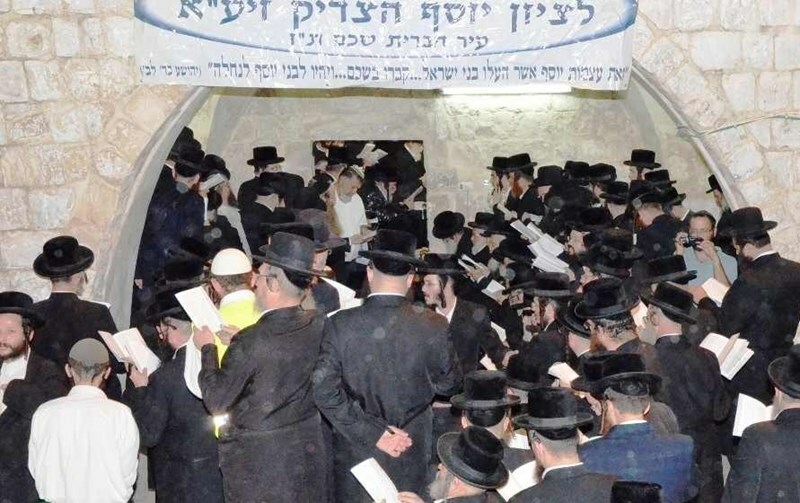 Hundreds of Jewish settlers stormed the Yusuf tomb east of Nablus before dawn Tuesday under heavy Israeli troop protection. Eyewitnesses told the PIC reporter that dozens of Israeli troops raided the city and closed the roads leading to the tomb to pave the way for a number of buses carrying hundreds of settlers. The settlers arrived in seven buses and left after dawn after offering rituals, the sources added. Clashes broke out in the area with Palestinian youths from nearby Balata refugee camp who threw stones and empty bottles at the intruders while the Israeli occupation forces fired tear gas and live bullets at the youths. On the other hand, two young men were nabbed Monday afternoon after Israeli forces erected a number of military checkpoints at the entrances of Assira town to the north of Nablus. IOF soldiers also raided the town at dawn Tuesday and broke into several homes but no arrests were reported. Israeli soldiers, stationed across the border fence on the eastern border with Gaza city, fired on Tuesday morning rounds of live ammunition, and one shell, targeting a number of farmlands and homes. The Palestinian News & Info Agency (WAFA) said the soldiers, and armored vehicles, fired dozens of rounds of live ammunition, and a tank shell, hitting farmlands and homes, causing property damage but no injuries. Earlier on Tuesday, the soldiers claimed a mortar shell, allegedly fired from Gaza, landed and exploded near the border fence, east of Rafah, in the southern part of the Gaza Strip. Israeli soldiers conduct daily violations and assaults against the Palestinians and their lands in different parts of the Gaza Strip, especially in areas close to the border fence in the northern and eastern parts of the coastal region. The violations include frequent assaults against Palestinian fishers and their boats in Gaza territorial waters, and even on the shore. 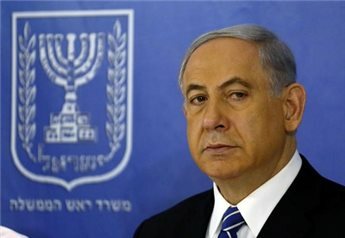 Israeli Prime Minister Benjamin Netanyahu warned Monday that the term of the incoming top Israeli commander would be tougher than that of his predecessor. "I promise you Gadi (Eisenkot)… you will not have a single day of grace. The Middle East is disintegrating. States are collapsing. An empire is charging into this vacuum – Iran," Netanyahu said. "It aspires to acquire nuclear weapons. It is trying to encircle us with four murderous arms. Three, for now – one in Lebanon, one in Gaza and a new one – on the Golan. It vows openly to destroy the State of Israel in one way or another. Joining it are the forces of extremist Islam who are breaking through every crack in the Middle East and bringing their murderous acts to the entire world." He added, according to the Israeli daily Haaretz, that "The next four years will be no less difficult. To my assessment, they will be even tougher. We will require every tool, every person, because there's no mercy for the weak in the Middle East. Only the strong ones survive. The IDF is strong in spirit, and certainly in might." Lt. Gen. Gadi Eisenkot assumed the position of the 21st chief of staff on Monday, Haaretz said. 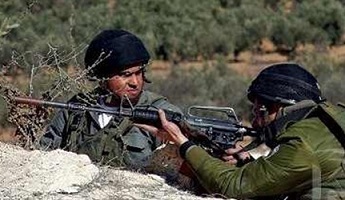 Israeli Occupation Forces (IOF) opened on Monday machinegun fire towards the Gazan farmers and shepherds in various areas in the Israeli-besieged Gaza Strip. 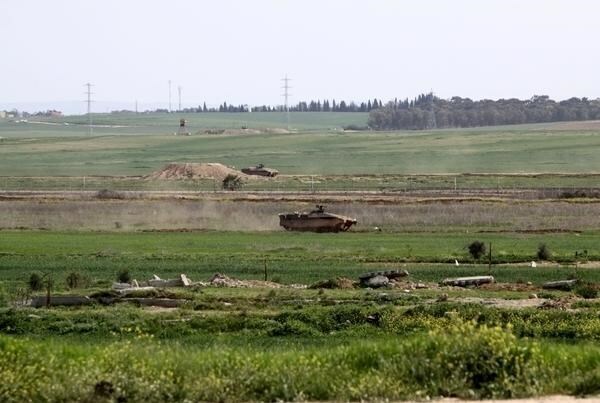 Palestinian security sources said the IOF fired machineguns at farmers to the east of Khan Younis in southern Gaza and toward shepherds to the east of al-Maghazi refugee camp in Central Gaza. No casualties have been reported. Local sources told the PIC reporter that the forces, stationed at the Israeli security fence area to the east of Khuzaah town, fired at agricultural lands in the town with no casualties reported. The arbitrary shooting coincided with flying Israeli helicopters over the region down to the eastern outskirts of Rafah city, the sources added. The shooting is added to many other similar actions breaching the truce agreement signed between the Palestinian resistance and the Israeli occupation under Egyptian supervision last August which put an end to the Israeli 51-day aggression on Gaza. Dozens of Israeli army soldiers stormed on Monday the “Jerusalem Gate” protest camp to the east of Abu Dis in Jerusalem. The incursion took place while Palestinian activists were building a room in the camp pitched to protest the displacement of Bedouin families for settlement expansion. Local sources said the Israeli Occupation Forces (IOF) broke into the camp on the commencement of building a room within the camp area, using stun grenades and tear gas. The sources added that dozens of Palestinians suffered severe suffocation resulting from firing tear gas by the IOF directly at the protesters and inside the tents. Israeli forces raided the "Jerusalem Gate" protest camp near Abu Dis on Monday and detained three Palestinian activists during clashes, a spokesperson said. Hani Halabiya told Ma'an that Hassan Matar, Rafat Shihada, and another unidentified activist were detained as Israeli forces fired tear gas, rubber-coated steel bullets and stun grenades during the raid. Several other people were assaulted with batons. The raid took place as dozens of activists had started building concrete rooms inside the protest camp, which was originally set up in early February but has since been demolished five times. At least three bulldozers had surrounded the camp, Halabiya said, with activists determined to prevent the destruction of the area. 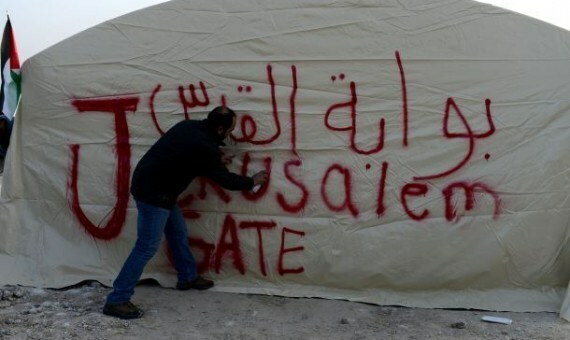 The camp was built in protest against an Israeli plan to build Jewish-only settlements in the E1 corridor east of Jerusalem on the way to Jericho where Palestinian Bedouins have been living for decades. The majority of Bedouins in Israel and the West Bank live a relatively settled but still sometimes semi-nomadic lifestyle, residing in permanent villages but pasturing livestock in adjacent areas. Israeli restrictions on movement -- in order to build Jewish settlements on Palestinian lands previously used by Bedouins or through the construction of the separation wall to cut through the West Bank -- have severely curtailed Bedouins' traditional nomadism. (NPSC) located in Newcastle-upon-Tyne in England. He is also actively involved with his local branch of Amnesty International. Bowman was taking part in a peaceful demonstration along with other international solidarity volunteers protesting Israel's continuous violations of Palestinian human rights in the village of Bil'in, located in the West Bank just north of Ramallah. Palestinian, Israeli, and international activists gather in the village of Bil'in each Friday to protest the construction of the illegal Israeli separation wall which has divided the village. Previously, President Jimmy Carter has joined the Bil'in protests, as has Richard Branson. In April 2009, a Palestinian man, Bassem Abu Rahmeh was killed when an Israeli soldier fired a teargas canister into his chest. The death of Bassem Abu Rahmeh was depicted in the 2011 film, '5 Broken Cameras.' The following year, Jawaher Abu Rahmah, a 36 year old woman, was also killed following protests at the village. The conditions of Ms. Abu Rahmah's death were contested and most likely she died from suffocation following teargas being hurled at her face.